Sandra Turley was born in England in 1950 and studied at the University of Ulster, Coleraine from 1968 to 1971 and at Queens University, Belfast from 1971 to 1975. 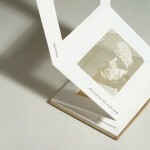 The artist book ‘This Original Self” within the Wexford County Art Collection has absence as its subject. Created through the process of Devore Printing, in which the natural fibres of the fabric are burnt away leaving ghostly images of a portrait with text from a poem. The portrait and the words within this book are never complete, sentences never begin or end, everything is fragmented and suggested. The book is bound in an accordion style in cloth-covered boards. This entry was posted in Artist Profile and tagged Arts Council of Northern Ireland, Golden Thread Gallery, Iontas, The Engine Room Gallery, The Tyrone Guthrie Centre Residency, University of Ulster. Bookmark the permalink.